‘I’m sure I’ve read something, too, about the robber of memories,’ said the driver of the pickup van, as we pondered together the origins of the phrase I had already heard several times in Colombia. I had thought at first it was a line from a García Márquez novel, or else some popular euphemism for Alzheimer’s in the more rural parts of the country. But the driver now remembered a folk tale about a robber who came on a horse late at night to steal your memories. When you least expected him. I was heading at last towards the heart of rural Colombia, towards a land where legend and reality were entwined. Some ‘unforeseen problems’ had meant that I was doing so for the moment by road. The Humberto Muñoz, flagship of the Naviera Fluvial Colombiana, had got stuck on a sandbank while returning from Barrancabermeja to Barranquilla. I was told by Hector Cruz to expect a delay of at least a few days, ‘hopefully not more’. This gave me the opportunity to visit earlier than I had planned the once important riverside town of Mompox, on a branch of the Magdalena no longer used by the bigger boats. The pickup van had collected me from my hotel at four in the morning. Since then I had lost all sense of time and place. Though crammed uncomfortably between the driver and a mother and her young child, I had managed at first to sleep, waking up briefly at dawn to see what I thought was a reddish glint of distant snow. We were passing through yet another village sprawled along the roadside, with its profusion of workshops, bamboo-covered stalls, offerings of fruit juices, coconuts, arepas, plantains, pork sandwiches. My eyes were closing again when I caught a sign reading Aracataca, the birthplace of García Márquez, the model for Macondo. Though I might have been dreaming. The next time I woke up was to hear the driver saying something about a ‘donkey library’, a Biblioburro. Its founder was a teacher from the small village of La Gloria, where we were going to have a breakfast stop long enough for me to see him. He was an ‘international celebrity’, someone who had to be seen by every traveller passing through the village. At this hour, said the driver, I would find him at his school. The school, a few rows of wooden benches under an awning, was just around the corner from where the van pulled up. The teacher, a smiling, dapper man in his early forties, called his young class to order following the flurry of excitement caused by the arrival of the gringo. He gave them some tasks to do while he went off to talk to me. ‘On leaving the main road at La Gloria, you used to enter a lawless territory under the control of the paramilitaries. Until two or three years ago, an outsider like you would have been stopped immediately,’ he said, as he walked with me to the village’s outskirts. He wanted to show me his two donkeys, Alfa and Beto, and the small, newly built structure where he housed his library. He then saddled the donkeys, loaded them with books, and mounted Alfa so that I could take his photo. The van in which I was travelling suddenly appeared, its driver shouting to tell me that we should get going. The teacher urged me to follow the Biblioburro on Facebook, and then searched for a pen to write down his details. Beto, seeing his opportunity to escape from a life of literature, made a wild dash towards a distant patch of green. We ran behind him, joined by one of my fellow passengers, a hitherto silent man whose rural instincts had now joyfully been released. The donkey was scattering books everywhere. I bent down to gather them up, leaving the teacher and the passenger to disappear into a rolling and expanding scrubland dotted with giant trees and palm-thatched adobe huts. THE MOMPOX ROAD, a badly rutted track, headed slowly down towards the river. I was back inside the van, my head hitting every now and then an exposed bolt in the roof. The passenger who had given chase to the Biblioburro was keeping everyone laughing with tales of sexual initiations involving donkeys. A decrepit old wardrobe we were carrying was groaning alarmingly. The heat outside was rising rapidly, blurring the world around us into a somnolent haze. A grove of mango trees and a rusting old car ferry were waiting for us at the river’s edge. The wardrobe had fallen to pieces, and one of the van’s tires had to be repaired while we were being ferried across a narrow stretch of water. The heat was asphyxiating and sweat was stinging my eyes. We landed on a shady island, near a town that had been left to decay. The van left me at a palace in the centre of a Mompox that did not seem at first like a place of bricks, mortar and stone, but rather some memory uncovered from my distant past. ‘MOMPOX DOES NOT EXIST,’ says the hero of García Márquez’s novel, The General in his Labyrinth. ‘Sometimes we dream about her, but she does not exist.’ The general in question was the Liberator Simón Bolívar, who, having freed South America from Spanish rule, was now a dying man in his late forties, abandoned by most of his friends and supporters, exiled from Bogotá, and on his way to his imminent death in Santa Marta. García Márquez himself admitted that his novel was less a study about illustrious heroes than a eulogy to the Magdalena, the river of the Liberator’s final journey. The Mompox perceived by the disillusioned general on awaking from a delirious fever was a town ruined by years of fighting but still faithful to him, still capable of conjuring up past triumphs and happiness. Though its architecture spoke of the early days of Spanish rule, when it had stored much of Colombia’s gold and silver, its recent history was one of enlightened anti-colonialism. It had the oldest university in the Caribbean world and would in 1873 receive as a gift from France a statue of Liberty which preceded that of New York. But for García Márquez, and for his imagined Bolívar, Mompox was essentially a magical construct of the Magdalena, a place destined to stagnate, a chronicle in stone of a death foretold. The river that had given birth to the town would eventually be the cause of its terminal decline. The buildup of sediment in the water had reached such a level by the beginning of the last century that river traffic was redirected to the prospering new river-port of Magangué. Mompox, unconnected by bridge to the mainland, became a literal backwater, remote, moribund, barely accessible, guarded by paramilitaries. A place to dream about, a place that might not exist at all. I THOUGHT IMMEDIATELY of the small whitewashed towns of southern Spain, with their palaces of absentee landowners, their streets that came fully alive only towards evening, their blinding whiteness highlighting the blackness of shadows and ironwork grilles. I thought in particular of the town of Osuna, where a horse and cart had once awaited me at the railway station, and nuns from the closed-order convent of the Immaculate Conception had taken care of my washing. But there was something else intensely familiar about Mompox, and I could not think what. It was midday, and the heat had chased everyone off the streets, and even from the reception area of my chosen hotel, the Doña Manuela, whose rooms were arranged around an enormous arcaded courtyard choked by a tree veined with lianas and exposed roots. A woman eventually came to hand me a key from a wall of keys. I was apparently the only guest. I left my room as soon as I could, to wander around the empty streets in the hope of encountering some form of life. Next to the hotel I peered into the shaded courtyard of another palace, whose poetic name I later learnt was used in Colombia to signify a retirement home, Casa de Recuerdos, ‘House of Memories’. I walked down to the river, to a narrow street bordered by the river’s banks and a further row of white, one-storeyed buildings, sixteenth or seventeenth century in origin, the windows protected by massive grilles, the architectural elements highlighted in ochre, the plasterwork crumbling and corroded by damp. A white parapet followed the faint curve of the river, alongside a row of trees, above banks strewn with what seemed like a decade’s accumulation of rubbish. A worn stone plinth recorded the various stays in the town of Simón Bolívar, while above swung the tattered paper streamers of festivities that were perhaps still waiting to happen. In the far distance was a brightly painted octagonal church tower said to feature in a García Márquez novel. I headed towards it. An old jeep with a broken window, the first car I had seen since leaving the hotel, was parked alongside the parapet, in front of an optician’s called Optica Marchena. The optician’s large wooden door was open, revealing a dark interior cooled by a ceiling fan and a tall, slim man slumped on a wicker armchair. He straightened up as I looked at him. He seemed to be expecting me. He welcomed me in. He had thick black eyebrows, a deep voice and a smile that exposed prominent teeth. He was someone I thought I already knew, and I realized why after he had been talking for a little while, his conversation interrupted by frequent chuckles, his features contorting when wanting to give emphasis to a line or to find exactly the right word. He was almost identical to a close friend of mine from Seville. Without asking me at first anything about myself, he offered me in turn a chair, a cool glass of the locally made fruit wine, the keys to the car parked outside, a small towel to wipe my profusely sweating brow. He said he always carried such a towel with him whenever he went outside. 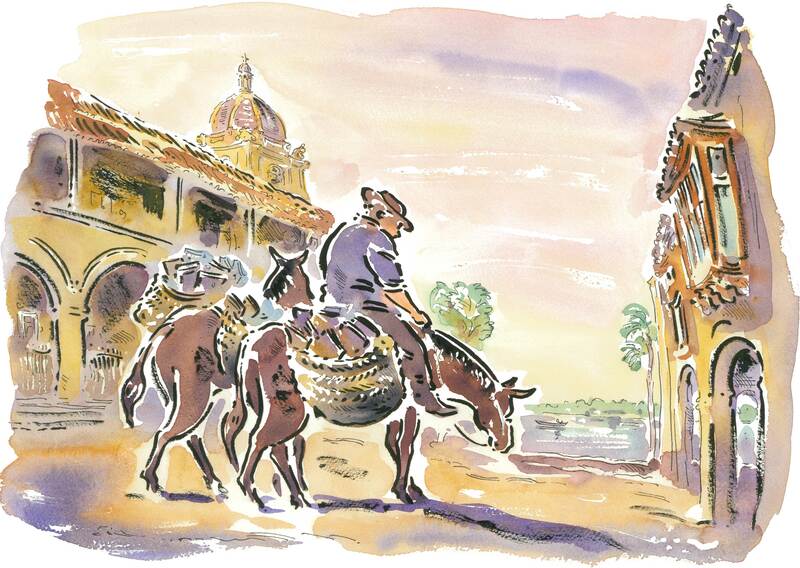 Mompox was one of the hottest places in Colombia and was now suffering from what he called ‘the worst heatwave in years’. After half an hour of talking I found out that his friends knew him as Nando and that his grandparents had emigrated to Colombia from the Andalucian town of Marchena, between Seville and Osuna. He was not related to my Sevillian friend, but he had a cousin who still ran a Marchena bar I had often frequented. AS WE SAT at a shaded outdoor table, overlooking the river’s rubbish-strewn banks, a friend of Nando’s appeared, wearing a baseball cap. He was introduced to me as ‘a descendant of the town’s original Spanish settlers’. He was like one of the impoverished aristocrats from a Golden Age tale, scrawny and shabby, but with the distinguished, finely sculpted features of an El Greco portrait. The heat showed little sign of letting up by late afternoon, when we went to see the fallen aristocrat at his ‘palace’. We found him at his dental practice opposite, a cubbyhole stuck in some indeterminate moment of time, with a reclining dentist’s chair similar to those of my youth and a general look of having been unused for years. He was typing with one finger at a bulky computer. He said he was doing some genealogical work. He showed me on the screen his family crest and some pages of names dating back to the fifteenth century, among which was that of an ancestor who had been ennobled for his part in the Christian wars against the Moors in Granada. His ancestral home, entered through an iron-studded wooden door, was a rambling dwelling, with heavy red-leather furniture, various abandoned rooms and walls covered with sepia family portraits. He was telling us about his plans to turn the building into a boutique hotel when a loud knock announced the arrival of a man who referred to himself as ‘the poet of Mompox’. ‘At last I’ve caught up with you,’ mumbled the poet timidly, his evident emotion competing with his solemn gait and expression. The poet spoke in a Spanish that was formal and archaic even by Colombian standards. Addressing his town by its full name of Santa Cruz de Mompox, he talked about the ‘incomparable honour’ of my visiting ‘these distant American lands so full of illusions yet so tragically forgotten’. A small article in a Barranquilla newspaper had alerted him to the fact that I might come to Mompox and to my plan of sailing up ‘our noble and majestic Magdalena’. He handed me an ‘unpublished’ poem of his about the Magdalena (‘a river that brings up memories’) and wrote on it a dedication to his ‘dear friend Michael Jacobs, in the hope that this humble work will be of some use to him in his great project’. The slow peal of funeral bells started sounding and mourners filed past the window grilles of the palace, some carrying the coffin, others shielding themselves with parasols from the relentless sun. After we had all stepped outside to watch them, a burly middle-aged man with a copious moustache pulled up on a motorcycle beside us. He too had been looking for me. He turned out to be the town chronicler, a lawyer and landowner of South Italian origin who wanted us to meet in his house once the funeral mass was over. By dusk, when our expanding group had reconvened in the chronicler’s sitting-room, under a monstrous, slowly rotating ceiling fan, I was pondering again the strange familiarity of Mompox. Three women were embroidering in a dark corner while the men sat around a central table laden with refreshments, devising ways of entertaining me over the coming days. I was in a place I could only have visited before in a dream or in my imagination. Perhaps I was in one of the Sicilian towns my father had described, where he had been treated almost like royalty, introduced to everyone, invited everywhere, encouraged to participate in local intellectual life, flattered into believing that he was a person of importance and brilliance. The scene in front of me became fleetingly transformed. I was in the town of Syracuse on an April afternoon in 1944. The noise of the ceiling fan became the sound of steady rain, while the grand house I was in had turned into my father’s spacious nineteenth-century quarters. My father, exhausted after some heady days of socializing, was with a couple of journalist friends, one of whom was a talented and well-read young writer who came to see him every day. The other person, Franco Libero Belgiorno, was an established magazine editor and drama critic who had brought with him three tickets to a performance that night by a travelling company from Messina. My father would have happily remained where he was, comfortable and dry, and talking about literature. But the forceful Belgiorno eventually lured him into the rain with the promise of what he said would be a memorable night at the theatre. THEN NANDO BEGAN TALKING about iguana eggs. He was determined I should eat some before leaving Mompox. They used to fill the markets, hanging in tresses like garlic, but they were now illegal food and could not be found so easily. To many people, himself included, they were a delicacy that brought back memories of childhood. He would get me some, he promised, as he walked me back late at night to the Doña Manuela. We would have them one day for breakfast. ‘Think of Humboldt,’ exhorted Nando a few hours later, after arranging an afternoon excursion on a motorized canoe, ‘I’m sure he ate iguana eggs. It’s a rite of passage for anyone who travels up the Magdalena.’ Our canoe had crossed the river and was cruising along banks swarming with iguanas, who slithered in and out of the water, darting at me what I was convinced were hostile glances. The knowledge that I had condoned their pointless killing weighed on me, and I sensed that this environment I had violated would eventually demand its revenge. We left the river to drift through the endless lakes and swamps surrounding the town. The winter floods had miraculously spared Mompox, but the livelihood of so many of the people who lived in the nearby hamlets and farms had been destroyed. Whole herds of cattle had been drowned, cultivated fields remained sodden and rotting, and mango trees had withered and gone yellow from too much water. But the beauty of the world we had entered soon made me forget almost everything else. A few tiny huts on stilts had precariously survived in a landscape fringed by banks of water lilies, palms and exotic trees in bloom, a landscape in which even the translucent yellows of the dying mangoes had a seductive sensuality. We bathed in waters once ruled by caimans, then stopped off at an enchanted island whose few inhabitants were stewing a turtle for lunch. A parakeet landed on my shoulder, while up above shrieking monkeys jumped from tree to tree. The darkness came with disconcerting speed. Dramatic clouds, rapidly forming during our final, late-afternoon swim, went suddenly black, then red. The silence was broken by the cries of birds and the buzzing of a million mosquitoes. We headed back as fast as we could. The rain held off, though not the night, which hampered our navigation across shallows, through narrow channels blocked by reeds and overhead branches. A fishing net became entangled in the engine, and for half an hour we were trapped in a world of mysterious sounds, watching the moon rise above the motionless, prehistoric-looking profile of an iguana. WEDNESDAY WAS THE NIGHT when the townspeople of Mompox traditionally congregated at the cemetery. Death in South America is a more public spectacle than it is in Spain, where cemeteries tend to be banished to the ugliest and most remote suburbs. The one at Mompox was situated only a street away from what counted as the centre of local nightlife – a square with a trio of stalls selling drinks and charcoal-grilled meats. On my last night in town, a Wednesday night, I relaxed on the square with Nando, planning to go on afterwards to one of the weekly gatherings at the tombs. I had been in Mompox far longer than I had anticipated. Nando reminded me that travellers in the past had never been able to predict how long they would be staying there. In the days before steam travel, they had been at the mercy of the boatmen known as bogas, who, on reaching Mompox – the home town of so many of them – got perpetually drunk and kept on postponing their departure. I was at the mercy, instead, of the Naviera Fluvial. The Humberto Muñoz was still grounded somewhere north of Barrancabermeja, and for a while I had almost given up on the idea of journeying up the river on a big vessel. But then Hector Cruz rang to say that alternative arrangements had been made. I needed to get back to Barranquilla as soon as possible. News of my departure from Mompox spread as quickly as the news of my arrival. Members of Nando’s circle – the poet, the chronicler, the fallen aristocrat – soon joined us for a bottle of rum on the square. They wanted to say goodbye. They also did not want me to miss the Wednesday tertulia at the cemetery, a ritual claimed by the chronicler to be unique to Colombia. Even though the rum made us light-headed, the conversation in the square revolved almost exclusively around cemeteries. Nando told us a ‘true story’ about a small Amazonian river-port whose inhabitants were forbidden to die until a cemetery was built. ‘And no one did die until the local cemetery was finally completed, after which everyone started dying.’ The poet followed this with a mention of the cemetery at Puerto Berrío, a port I would actually be passing if I ‘managed to make it south of Barrancabermeja’. The place, he said, was where the families of those who ‘disappeared’ during the troubles annually invoked the spirits of the dead to help them recover their loved ones. As we walked at last towards the cemetery, shortly before midnight, I recalled a large map of Colombia that hung in a back room of Nando’s practice. It was covered with tiny flags that marked the places where people had been kidnapped or ‘disappeared’ at the hands of guerrillas and paramilitaries. An especially large cluster covered the upper reaches of the Magdalena. Nando told me that the flags were his way of ensuring that the victims were never forgotten. I was still picturing the map and the exact location of the flags as we approached the dimly lit cemetery, where I could vaguely make out hushed groups of people behind an open ironwork gate. To the faint but inappropriate accompaniment of a carnival band playing in an adjoining street, the poet read out the inscription placed above the cemetery’s entrance. ‘This is the frontier that separates life from death,’ he recited in the portentous voice of a ham actor. I was trying to suppress my laughter until a brief and unaccountable shudder went through me. The background music had stopped for a few seconds and all I could hear were the murmurings of the cemetery’s nocturnal visitors. I felt as if I were truly nearing the land of the dead. 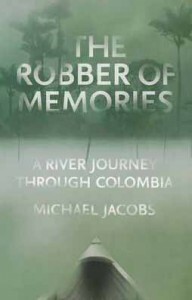 Extracted from The Robber of Memories: A River Journey through Colombia by Michael Jacobs (Granta). Michael Jacobs (1952-2014) was a writer, an art historian and one of the great interpreters of Spain and Latin America to the English-speaking world. He was born in Italy and studied history of art at the Courtauld Institute in London. His travel books included Andes (Granta) and The Factory of Light, which was shortlisted for the 2004 Thomas Cook Travel Book Award.